Did the Nazis attempt to destroy evidence of the Babi Yar massacre by exhuming and burning the bodies? There is only one survivor who exhumed and burned the remains of the Babi Yar massacre. Italian Holocaust denier Carlo Mattogno identifies this sole survivor as Vladimir K. Davidov (Davydov): Davydov “is apparently the only witness who claims to have participated in the cremation of bodies of Babi Yar.” This survivor, according to Mattogno and other Holocaust deniers, is “wholly unbelievable.” Therefore, it never happened. Contrary to what deniers claim about Babi Yar, there was not only one survivor of the exhumation and burning process. Seven others survived. Their testimonies, all of which appear in different sources and were provided at different times, corroborate each other. Further, Nazi perpetrators who directed this exhumation and burning process also testified that it occurred. Before the Germans retreated from Kiev, Ukraine in the fall of 1943, they attempted to conceal the evidence of their atrocities. Paul Blöbel was head of Sonderkommando 4a, which, together with other German units, executed 33,771 Jews at Babi Yar only two years prior. Blöbel was assigned the task of exhuming the bodies and destroying the evidence. To speed up the task, a special work group called ‘Sonderaktion 1005’ was formed using 300 prisoners from the Syrets concentration camp near the ravine. From August to September 1943, these prisoners were chained together and forced to exhume and cremate the bodies. Cremation pyres were built on iron rails stacked with oil-soaked firewood. Some 2,500 to 3,000 bodies were burned on each cremation pyre. The detail was also assigned to search the ashes for gold teeth; any remaining bones were pulverized and the ashes were scattered over the area or mixed with sand. The mixture was then returned to the ravine. Was there really only one witness to the process? Mattogno’s assertion that there is only one witness to the exhumations and cremations is incorrect. The members of the exhumation work group (‘Sonderaktion 1005’) reasoned that when their work was finished the Nazis would in turn execute them. Thus, they escaped en masse on September 29, 1943. Of the 300 plus men who worked in the Sonderkommando, several survived. Of the survivors, a number have given or published their detailed testimony over the years. This list includes: Vladimir Davydov, Jakov Steyuk, Vadislav Kuklia, Jakov Kaper, David Budnik, Ziama Trubakov, Seymen Berlyant, Leonid Ostrowsky, Yosif Doliner, and Isaac Brodsky. Their stories are important and corroborate one another. Other testimonies, such as those appearing in the Report of the Extraordinary State Commission on Destructions and Atrocities Perpetrated by the German-Fascist Invaders in the City of Kiev (1941-1944) [published in 1987], recount the same events and conditions: the shackles, bringing granite tombstones and iron grates from the Jewish cemetery, the construction of the ovens, the use of logs and oil, the layering of the bodies and logs, the capacity of each pyre (2,500 to 3,000 bodies), the teams which removed jewelry, rings and pulled out gold teeth, the crushing of the bones, the scattering of the ashes into the sand of the ravine, and the use of an excavator to exhume the bodies as time started to run out. Syrets concentration camp (also: Syretskij concentration camp), a Nazi German concentration camp erected in 1942 in a Kiev’s western neighborhood of Syrets. Barbed wire fence. By World War II unknown photographer (Babi Yar, Berdichev Revival) [Public domain or Public domain], via Wikimedia Commons. Contrary to the claims of Holocaust deniers, multiple eyewitnesses have come forward to share their experiences at Babi Yar. Vladimir Davydov, for instance, is not the “only” witness, nor is his testimony “wholly unbelievable”, as Mattogno claims. Davydov’s testimony is corroborated by the testimony of ten other survivors of the exhumation commando: Vladimir Davydov, Jakov Steyuk, Vadislav Kuklia, Jakov Kaper, David Budnik, Ziama Trubakov, Seymen Berlyant, Leonid Ostrowsky, Yosif Doliner, and Isaac Brodsky. Their testimony is corroborated by that of the perpetrators themselves, most notably Paul Blöbel, the head of the special commando set up to exhume and cremate the bodies in Babi Yar. 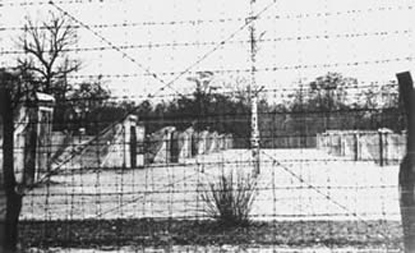 Carlo Mattogno and Jürgen Graf, Treblinka: Extermination Camp or Transit Camp? (Theses & Dissertations Press, 2004), p. 221 at http://vho.org/dl/ENG/t.pdf. This list was compiled from three sources: A. Anatoli Kuznetsov’s Babi Yar (Farrar, Straus and Giroux, 1970; Ziama Trubakov’s Riddle of Babi Yar and the Report of the Extraordinary State Commission on Destructions and Atrocities Perpetrated by the German-Fascist Invades in the City of Kiev at http://forum.axishistory.com/viewtopic.php?t=42076. These sources use several variations of these names, for instance, Davidov/Davydov and Beryland/Berylant/Berland. David Budnik, “Under a Lucky Star,” in Erhard Roy Wiehn, Jewish Fates in Kiev 1941-1943 (Part 5) http://www.ess.uwe.ac.uk/genocide/budnik05.htm. Yakov Kaper, “Thorny Road,” in Erhard Roy Wiehn, Jewish Fates in Kiev 1941-1943 (Part 7) at http://www.ess.uwe.ac.uk/genocide/kaper06.htm. Kaper was doubly “lucky.” He survived not only the Sonderkommando escape after the exhumation and burning of the bodies but he had also survived the original massacre of the Jews in the Babi Yar ravine exactly two years before. He was being transported by truck to the execution site when he jumped from it and escaped. A. Anatoli (Kuznetsov), Babi Yar: A Document in the Form of a Novel, translated by David Floyd (Farrar, Straus and Giroux, 1970), pp. 370-389. Kuznetsov’s book was written under the Soviet regime. Calling it a “novel” made it possible for it to be published at all, but even so it was highly censored. As of 1970 it has been printed in the West in an uncensored version. “That’s why it is denial not revisionism. Part VI: Deniers and Babiy Yar massacre (4)” at http://holocaustcontroversies.blogspot.com/2006/08/thats-why-it-is-denial-not-revisionism_06.html. Zakhar (Ziama) Trubakov’s oral history is available at http://collections.ushmm.org/search/catalog/irn502882. Trubakov’s account can also be read in Ziama Trubakov’s The Riddle of Babi Yar: A True Story Written by a Survivor of Mass Massacres in Kiev in 1941-43 (translated, edited and expanded by Reyzl Yitkin). The book now includes in the appendices the statements and testimonies of many other witnesses to the massacre or the attempt to erase the evidence of the crime. The Riddle of Babi Yar can be found on Kindle. You can read the entire Soviet report at http://forum.axishistory.com/viewtopic.php?t=42076. Yitzhak Arad, Israel Gutman, and Abraham Margaliot (editors), Documents of the Holocaust: Selected Sources on the Destruction of the Jews of Germany and Austria, Poland, and the Soviet Union (Eighth Edition) (University of Nebraska Press and Yad Vashem, 1999), “Evidence by Blobel on the Burning of Bodies and Obliterating the Traces of Bodies of Jews Killed by the Einsatzgruppen, Affidavit,” NO-3947, pp. 471-473.